insight. 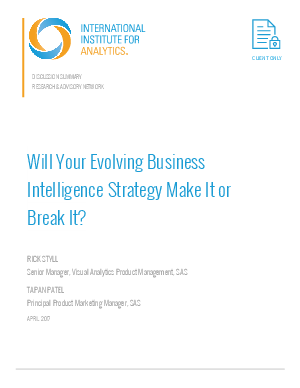 As technological capabilities and business aptitude with information continue to advance, the next generation of BI will be even more capable and valuable to the enterprise. To discuss today’s success factors and tomorrow’s opportunities, IIA spoke with Rick Styll, Senior Manager, Visual Analytics Product Management at SAS, and Tapan Patel, Principal Product Marketing Manager at SAS.